Still searching for the perfect holiday outfit? Not finding anything that flatters you the way you want or that is different from the same old same old? Not wanting to show up in the same holiday outfit you have been wearing for years or that you feel everyone else has too? WELL THEN, you need to hurry and put in your Mod Bod order! In our new MB Clothing fall line, we have some great ideas for you! Our Belle Skirt comes in Royal Blue and Red. These are such fun colors to make your outfit really appear festive, yet also be an essential piece in your wardrobe that you can use throughout the year. 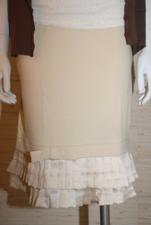 Pair that skirt with our beautiful feminine Anna Ruffle Neck Top. It will be gorgeous on you! Also our Victoria Skirt with pleats comes in black which looks great on everyone. BUT if you are looking for something a bit different, it also comes in ivory which looks so “holiday-ish.” It really does. And all of the bloggers that are reviewing our line are saying our Pencil Skirt is the sexiest skirt on the planet! Which is great because it also is really modest. It is long enough and the pleat in the back is CLOSED so you don’t worry about showing off too much back there. We love that our modest clothing can also make women feel beautiful and attractive. Looking for more of a casual holiday outfit? Maybe something you can wear with a great pair of denim jeans that will be a “bit” dressed up but still casual? We love pairing our Banded Cardigan with these Thick Belts. Such a flattering look! So hurry and put in your orders for your perfect holiday outfit at Mod Bod!